Organic chemists, with carbon chemistry as their subject, have developed all kinds of shorthand phrases to describe structures and phenomena that might otherwise take a sentence of two to explain. Here’s today’s example: the terminology of carbon-containing functional groups: primary, secondary, tertiary, quaternary. Primary carbons, are carbons attached to one other carbon. (Hydrogens – although usually 3 in number in this case – are ignored in this terminology, as we shall see). Secondary carbons are attached to two other carbons. Tertiary carbons are attached to three other carbons. Finally, quaternary carbons are attached to four other carbons. We use the same terminology for carbocations. 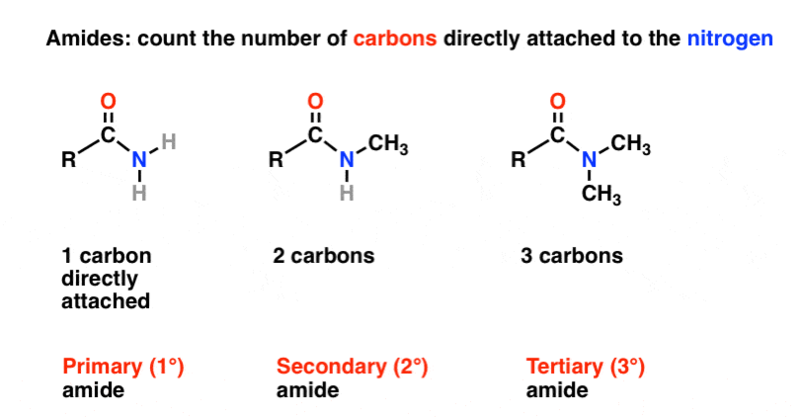 A primary carbocation is attached to one other carbon, a secondary to two, and a tertiary to three. You can’t have a quaternary carbocation without violating the octet rule either (you’d need an extra empty p orbital for that, bringing the total to 5). Alcohols also follow the primary/secondary/tertiary nomenclature. The rule for alcohols is that they are named according to the number of carbons attached to the carbon bearing the hydroxyl group: in other words, whether the hydroxyl bound to a primary, secondary, or tertiary carbon. You can’t have a quaternary alcohol – again, that would involve breaking the octet rule. [A bit of non-essential nomenclature: the carbon attached to the OH is sometimes referred to as the “carbinol” carbon]. A related category of compounds are the alkyl halides, which we encounter in SN1/SN2/E1/E2 reactions (among many others). The naming for alkyl halides is similar to that for alcohols: they are named according to the number of carbons attached to the halogen, where halogen is fluorine, chlorine, bromine, or iodine. Next, we come to amines, which are a little bit different. They are named according to the number of carbons attached to nitrogen. Primary, secondary, and tertiary amines are nitrogens bound to one, two and three carbons, respectively. Since the nitrogen has a lone pair, it is still possible to form another bond to carbon. These are called quaternary amines, although they bear a positive charge on nitrogen and are not at all basic. They are often referred to as quaternary ammonium salts. You’ll see the -ium ending quite a bit – it designates a positively charged species. Just quickly looked at your website here. It looks good. I like to see other organic chemists getting busy with blogs, exploiting Web 2.0. I started off with a blog and decided I would build myself a website. It is my overglorified CV but I often post articles from industry. Check it out at pharmnbiofuel.com. Thank you for your site! It’s saving my Hiney!! Accutally you CAN put 5 substituents at one carbon – and the guy how can do this is called George Olah! Yes of course, pentavalent carbon cations (carboniums) are believed to exist, but James’ blog is intended for undergaduate-level students and he is quite right in presenting it as a non-option. This small white lie will save many students from mistakes, and those few that are interested in a more advanced truth can easily look into the matter themselves. Finally! Someone was able to explain the primary, secondary, and tertiary amine thing. I’m not an O-chem guy at all, but I totally got this page. Thanks for putting it together. It finally makes sense. Hi there, may i know if we can describe the carbons in an aromatic compound as primary, secondary, tertiary or quaternary carbon? Or they are only applied to aliphatic carbons? Hope you can help. Thank you so much! For alkenes, the convention is to use “monosubstituted”, “disubstituted”, etc. Same for arenes. Can secondary carbon be attached to two carbons with one single bond, and one double bond? The structure below is a potent analgesic agent (pain reliever) (J. Med. Chem., 2009, 5685). How many secondary carbons are in this structure? I believe the definitions, “primary, secondary, tertiary” only hold for alkyl groups. So there would only be 6 secondary carbons and the alkenes do not count. Is there a technical term to call a carbon with one hydroxyl group attached? Can we call them “hydroxyl carbon” or “hydroxylic carbon”? Was searching answer for my chemistry homework…..didnt got on book….remebered google has answer to each question….came here….understood everything in matter of seconds…blessed you with all my heart a good life…….THANK YOU James…?????? Hydrogen. If Yes plz let me know.Thanx. Why doesn’t quaternary radical exist? Think about the maximum number of substituents that carbon can have.